The Manchester Township Police proudly presented a donation to the Ocean of Love charity last week from funds raised during the department’s Third Annual Elite Law Enforcement Fitness Challenge. 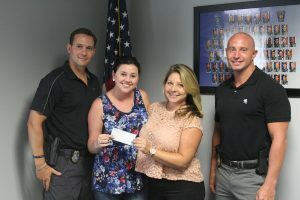 Detective David Fusaro and Patrolman Charles Gatnarek, organizers of the team-based challenge held at Harry Wright Lake in June, presented Ocean of Love staff Taylor Hearn and Tracy Ratz with a check for $2,600. The donation will aid the non-profit charitable organization in its mission to help Ocean County children with cancer and their families lead more normal lives. Ocean of Love helps to pay bills, gas, tolls, and other expenses for local families with a child dealing with cancer. Over the three years of the Fitness Challenge, nearly $20,000 has been raised for the Ocean of Love Charity, as well as the not for profit Manchester Township Police Foundation, Inc., and its programs. All of the officers who participated were proud to work together and compete for these worthy causes. To make a donation to Ocean of Love at any time, or to learn more about the organization and its four major fundraising events held throughout the year, please visit their website at www.oceanoflove.org. 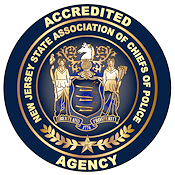 More information about the Manchester Township Police Foundation is available through the “Police Foundation” link on the Manchester Township Police website, www.manchesterpolicenj.com.